We present a rare case of cardiac arrest caused by torsades de pointes in relation to severe hypothyroidism, which highlights the importance of thyroid replacement therapy compliance. 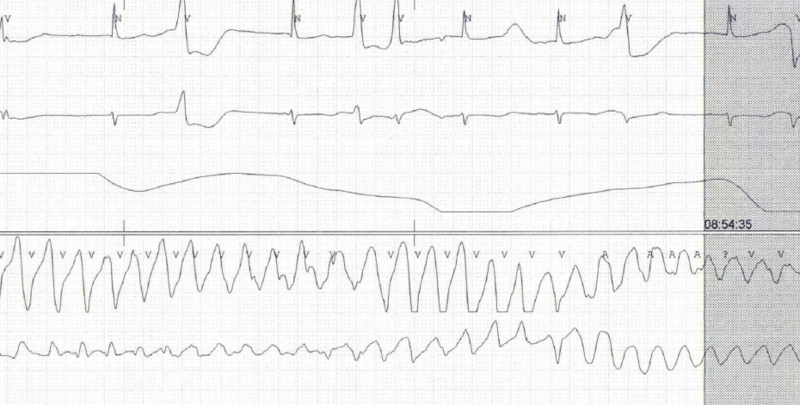 A 76-year-old woman was admitted to our hospital with a collapse, and while in the emergency department she sustained a witnessed cardiac arrest secondary to torsades de pointes (TdP) (figure 1). This was terminated with direct current electrical cardioversion followed by magnesium and potassium infusions. Over the next 48 hours she had four further short runs of self-terminating TdP. Our patient had a background of primary hypothyroidism, type 2 diabetes mellitus and stable angina. Her medications included: aspirin, levothyroxine, bisoprolol, furosemide, nitrazepam, tramadol, gliclazide, atorvastatin and lansoprazole. The initial electrocardiogram (ECG) showed sinus bradycardia, PR interval of 200 ms, prolonged QTc interval (640 ms, Bazzet’s formula) and T-wave inversions in lateral and anterior leads (figure 2). Her ECG from one year ago showed a normal QTc interval. Blood tests revealed hypokalaemia of 2.7 mmol/L, normal magnesium (0.82 mmol/L) and adjusted calcium levels (2.53 mmol/L). Potassium levels normalised within a few hours after potassium infusion. Her thyroid function tests showed severe hypothyroidism with high thyroid stimulating hormone (>150 mIU/L, normal range 0.3–5.5 mIU/L) and low free T4 (2.6 pmol/L, normal range 11.5–22.7 pmol/L). After further discussion, it transpired that our patient was not compliant with her thyroid replacement therapy. Levothyroxine was slowly re-introduced and serial ECGs showed a gradual shortening of QT interval with QTc of 444 ms six days after initial admission (figure 3). Thyroxine replacement therapy and risk of myocardial infarction: a cautionary tale!